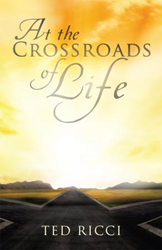 In his newest book, At The Crossroads Of Life ($11.99, paperback, 9781626970878; $5.99, e-book, 9781626970885) Ted Ricci shares ancient G.P.S.—“God’s Perfect Scriptures”—for anyone looking to receive divine direction in life. There is a road to follow that leads to a blessed life. Ricci sums up this sentiment in a catchy rhyme: “Where God directs, He protects and where the Lord guides, He provides.” This statement is supported by the outcome of the author’s life, as detailed in this book. Xulon Press, a division of Salem Media Group, is the world’s largest Christian self-publisher, with more than 15,000 titles published to date. Retailers may order At The Crossroads Of Life through Ingram Book Company and/or Spring Arbor Book Distributors. The book is available online through xulonpress.com/bookstore, amazon.com, and barnesandnoble.com.